A watermill is a structure that uses a water wheel to drive a mechanical process such as grinding flour, lumber or textile production, or metal shaping. A water mill that generates electricity is usually called a hydroelectric power plant. The first documented use of a water mill was in the first century BC and the technology spread quite quickly across the world. Commercial mills were in use in Roman Britain and by the time of the Doomsday Book in the late 11th Century there were more than 6,000 water mills in England. By the 16th Century waterpower was the most important source of motive power in Britain and Europe. The number of mills probably peaked at more than 20,000 mills by the 19th Century. The Norman Conquest introduced the feudal system to the country and ‘soke rights’ forced everyone to have their corn milled at the mill owned by their Manorial Lord which stayed in use until as late as the 19th Century. Although the “Right of Soke” was never written in law, it was commonly practised in Britain – and throughout Europe – until the 16th century, even after the country had moved away from feudalism. With agricultural developments at the beginning of the Industrial Revolution, people began to move away from agriculture into other industries. Rural water mills began to close down to be replaced by the large, industrial, port-based steam-powered mill and by the end of the 19th Century almost all rural watermills had ceased commercial production. See the short video below showing a working gristmill in Bhutan. Watermills are usually built beside streams or rivers to use them as a water supply. Very often these supplies were improved by the provision of mill races and weirs to help overcome the problems of different seasonal water levels. Many of the weirs seen on rivers today were originally built to help control water levels for watermills. Usually power from the waterwheel was transferred to the inside of the mill by a shaft extending from the waterwheel axle which connected to a large gear wheel called the Pit Wheel (because half of it lies below the floor level of the mill, in a pit). Power was then turned through 90 degrees by bevel gears to turn a large vertically mounted shaft leading to the upper floor of the water mill. At the lower level, this shaft drove a large Spur Wheel, which then provided power to turn the millstones. At the top of the shaft another large wheel, the Crown Wheel, was placed to drive other machinery in the mill, such as sack hoists. Millwrights were highly skilled craftsmen who could work with wood and iron to build the complex working machinery of the mill. Gristmills, or corn mills, grind grains into flour. 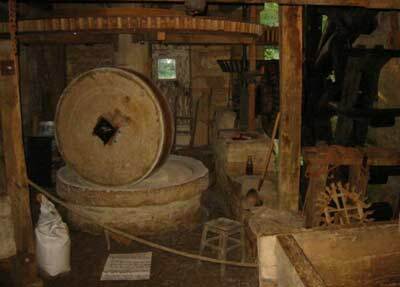 These were undoubtedly the most common kind of mill. Fulling or walk mills were used for a finishing process on cloth. Bark Mills stripped bark from trees or ground it to powder for use in tanneries. Cotton mills were usually powered by a water wheel at the beginning of the industrial revolution. Blast Furnaces, finery forges, and tinplate works were water powered. Furnaces and Forges were sometimes called iron mills. By the early 20th century, the water wheel gave rise to the water turbine, and cheap electrical energy made the watermill obsolete in developed countries - although some smaller rural mills continued to operate commercially into the 1960s. A few historic mills (for example, at the Wayside Inn -USA) still operate for demonstration purposes to this day, or even maintain small-scale commercial production as at Daniels Mill, Shropshire , Little Salkeld and Redbournbury Mill - all in the UK. In some developing countries the watermill is still widely used for processing grain. There are approximately 25,000 operating in Nepal, and 200,000 in India.